Starting solids can be a fun experience for you and your baby. It can also be overwhelming and scary, but with the right steps, you can set your baby up for a lifetime of optimal health! I understand that the intent of this message is that you shouldn’t necessarily be worried if your baby isn’t eating much solid food, because breast milk or formula is still their main source of nutrients and calories… BUT, what foods you choose to start with is super important because even if they’re only taking a couple bites and then losing interest, what they are taking in should consist of the nutrients they need as they enter the world of solid food! we also want to ensure their little guts (intestines) are ready to digest food. Babies are all born with permeabilities in the gut. Starting solids too soon can result in food sensitivities or allergies because their gut lining is not fully formed and is letting food particles into the blood stream, which the body will mistake for pathogens and attack, causing allergies or autoimmune conditions. We also want to ensure they’re getting 400-800 IU of vitamin D daily, as well as a daily dose of probiotics from birth. This will prep their gut as well as immune system. Vitamin D also helps them to absorb calcium. Before we choose what foods your baby should start with, we need to think of what nutrients they need. The nutrients that they need most at the 6 month mark and onward are iron and zinc. These are both abundant in animal foods like liver and egg yolk. Babies accumulate iron and zinc in utero and it slowly depletes over time. They also grow rapidly between 6-12 months, so their needs increase at this time. Iron is necessary for proper brain development. As mentioned, it’s most abundant in animal foods. It is also found in plant foods and fortified in cereals, but this is a different form of iron that is far less absorbable in the body. Zinc is necessary for building baby’s immune system, helping with physical and mental growth and development, as well as helping to create a healthy mucous lining in the stomach and gut. Until about 18 months of age, babies do not have the right enzymes to break down grains. This enzyme is called amylase and is necessary for the breakdown of carbohydrates. Grains can also block the absorption of iron and zinc, which, as discussed, are two of the most important nutrients for babies. For this reason, it’s not recommended to start with cereals. This can cause digestive upset and on top of that, they are not very nutrient dense anyway! I’d also avoid egg whites, honey, strawberries, kiwi, tomato, shellfish, citrus fruit, nuts and legumes until at least a year. These are highly allergenic foods and it’s best to wait until baby’s digestive system is a little stronger to introduce these foods. When starting solids, it’s important to start one food at a time, and “clear it” before moving onto another food. Clearing a food, means feeding it to your baby for 4 days straight and watching for reactions (rashes, vomiting, digestive upset). If there is no reaction after 4 days, you are safe to move onto the next food. Continue this way with each new food, and incorporate previously cleared foods as you continue. What foods do we introduce and when? As mentioned, our biggest priority is getting iron rich foods into baby. Starting with foods like egg yolk and liver are a fantastic way to do that. Day 5-8: sweet potato (mixed with LOTS of bone broth and coconut oil) *it may be better to start with squash instead of sweet potato, as sweet potato is dense and can cause some constipation if not mixed with enough liquid. Day 9-12: liver (cooked in onion, garlic and ghee, blended with some bone broth) *I took a risk here, starting with 3 new foods at once – if she would have reacted, I would have back tracked and isolated each food – however, these foods are not likely to cause a reaction. Tip: add a tiny pinch of sea salt when you warm up a portion, to control for the amount. Sea salt is great for mineral intake, but in very small amounts so that their little kidneys can filter it. Don’t salt your bone broth! If baby reacts to a food, remove it from their circulation, and re-introduce it again much later with a watchful eye. I like to think of the first few months of solids as the introduction phase. Think of introducing flavours to baby’s palette rather than filling them up. They should still be getting a lot of their nourishment from breast milk or formula. Babies may also not be so interested in food at the beginning. Stick to animal foods that are rich in iron and zinc so that even if they are only eating a tiny bit, they are getting some iron and zinc (think nutrient density over volume of food). I try to aim for 1-2 tbsp of solid food daily and will follow her lead to increase as we go! I love the 3 ounce silicone baby food trays with lids that you can buy. Every food I make gets placed into the tray and frozen. Once frozen I add the frozen pucks of food to a ziplock bag and label it. This way I can continue to make new foods and have a bunch of frozen food ready for me at any time! Tip: For each recipe, freeze in a silicone tray, and then transfer into a storage bag in the freezer. Label the bag, and heat up in a base of fat or bone broth in a cast iron pan when ready to serve. 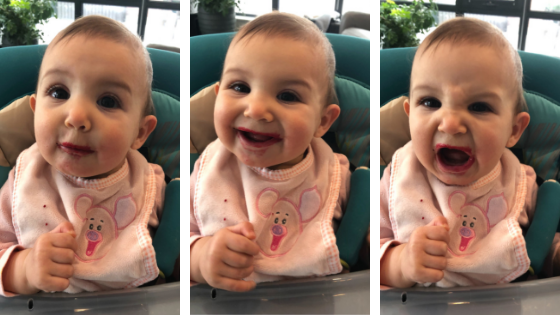 Starting solids can be a daunting task, but keep it simple and nutrient dense, and take your time between 6 months to a year, slowly introducing new foods and increasing volume as you go. Follow baby’s lead, and remember it can take up to 10 tries before a baby decides whether they like a food or not. Keep trying, and offer lots of breast milk or formula in between! Questions? Feel free to get in touch if you would like to do any nutrition consulting for yourself and/or baby! Thank you Stephanie for this great article on babies first solid food . This is invaluable information for parents to consider. I wish I had this knowledge when I had my babies. Brava Stephanie!! Keep spreading the loving words of parenting and teaching by example. Such a great article! Thank you for sharing it with everyone. I will def try bone broth which seems like a good idea. How mainstream advices are about cereal and that just does not make any sense. It’s beyond me as well! We have to do our own research and take nutrition advice from nutrition practitioners, not doctors. Doctors are simply not trained in nutrition.